Are you home on semester break from college or graduate school? Do you have a college student son or daughter who’ll be home this summer? Want to find a reason for your matriculated grandchild to stay with you for at least eight weeks? A Wild Care rehabilitator works with a female Black Scoter. Photo courtesy of Wild Care. 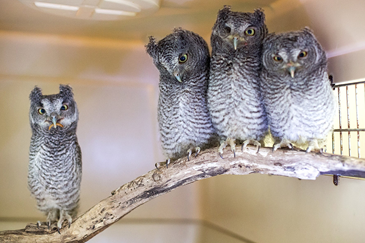 Wild Care is looking for undergraduate and graduate interns to work in their wildlife rehabilitation center Eastham. Annually, Wild Care admits between 900 and 1400 animals, native to Cape Cod, the Islands and southeastern Massachusetts for rehabilitation and orphan rearing. Interns receive training and gain experience in rehabilitation techniques, volunteer management, and public education, from staff and veterinarians volunteering their services. Wild Care accepts interns for the spring, summer, and fall of each year. Maximum length of an internship is negotiable, contingent on performance, and is at the discretion of the Director. At this time we are only reviewing applicants prepared to make a minimum commitment of eight weeks. Interns work under the direct supervision of the licensed staff and in cooperation with the Director and other volunteers. The extent of a student’s experience depends on the type of situations presented by the animals admitted and the comfort level of the intern. Because housing is so costly on Cape Cod, a student who can stay with parents or grandparents would be ideally situated to intern with Wild Care.